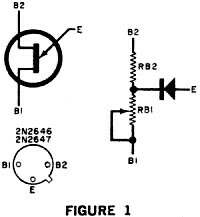 The unijunction transistor (UJT) was originally known as a 'double-base diode' and explains why to this day the terminals are labeled 'E,' "B1,' and B2." It is commonly modeled as a diode connected between two resistors, with one resistor being variable. As the name implies, unlike a bipolar junction transistor (BJT) that is more familiar to most people and has two semiconductor junctions connected to the base, a UJT has just one junction. As is explained in detail in the article, the net effect of the UJT's arrangement is a region of negative resistance which makes it good for use as an oscillator. 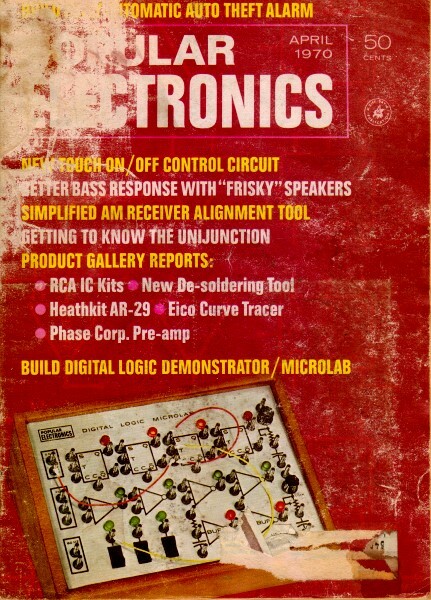 In fact, the relaxation oscillator was one of the most popular uses of the UJT. An all-round signal generator: saw-tooth, square-wave, sine-wave. Almost everyone who has an interest in electronics is aware of the existence of a device called the unijunction transistor, or UJT. (If he remembers it from its very beginning, he might recall that it was originally referred to as a "double-base diode.") The UJT is used most often in circuits requiring a positive-going spike pulse and, occasionally, as a generator of sawtooth waveforms. However, the UJT is actually much more versatile than these two uses would imply. It can also be used to generate square waves and, believe it or not, sine waves having quite pure waveforms. It behooves the serious electronics experimenter to learn more about all of these uses - and to do so, he will need to know more about the UJT itself. How the UJT works. The UJT can be represented by a circuit approximation consisting of two resistances in series, with a diode connected at their junction as in Fig. 1. (Also shown in the figure is the accepted schematic symbol and base diagram for the UJT. Note that in both cases the leads are identified as E, B1, and B2 for emitter, base-1, and base-2.) The resistance approximation is a passive representation of the UJT. In simple terms, this means that a pair of resistors and a diode connected as shown will not operate as a unijunction transistor. The approximation is simply a means by which operation of the UJT can be explained. In the majority of applications, the emitter is the control electrode of the UJT. The magnitude and polarity of a potential applied to the emitter determine whether or not the UJT will fire. With the emitter circuit open (diode nonconducting), resistance RB1 is maximum, and the sum of RB1 and RB2) called interbase resistance, is between 5000 and 10,000 ohms for the 2N2646 and 2N2647 (two typical, useful UJT's). Resistance RB1 is shown variable because current flow in the emitter circuit causes a decrease in the ohmic value of this resistance. 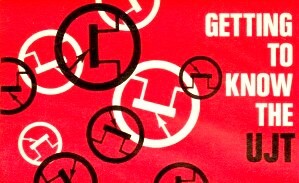 The greater the current flow, the lower the resistance. Hence, a UJT exhibits negative resistance, a characteristic that can be thought of as amplification. What actually happens inside the UJT is that current flowing into the E-to-B1 circuit "pulls" current carriers from the B2 area, increasing the circuit's conductance. The supply voltage, usually applied through a series resistor, is connected across the interbase resistance, B1 to B2, with B2 positive with respect to B1. To fire the UJT, a positive potential (called the peak-point voltage) is applied to the emitter. The ratio of RB1 to the interbase resistance is called η (Greek eta), or the intrinsic standoff ratio. The peak-point voltage is this ratio times the supply voltage plus the potential hill of the diode (about 0.5 volt). Thus, the voltage required for firing the UJT varies as the supply voltage is varied, and in the same direction. UJT relaxation oscillators. The schematic diagram in Fig. 2, or some variation of it, is probably familiar to most experimenters. 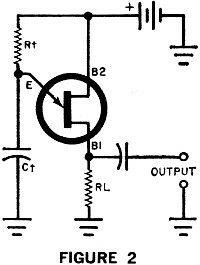 It is the one most commonly used circuits for relaxation oscillators by circuit designers. Referring to the diagram, capacitor Ct charges up through resistor Rt at a rate determined by the RC time constant of these two components. The larger these values, the slower the charging rate. During the charging interval, the emitter junction is reverse biased, and the only current flowing in the emitter circuit is due to leakage (similar to the Ico of a bipolar transistor). Emitter leakage for the 2N2646 is a maximum of 2 µA, and for the 2N2647, only 0.2 µA. When the potential across Ct reaches the value of peak-point voltage for the particular UJT being used in the circuit, the emitter junction goes suddenly into conduction. Using the UJT approximation shown in Fig. 1, RBl promptly drops to a much lower value and Ct in Fig. 2 discharges abruptly through load resistor RL, producing a spike pulse of voltage across the output terminals. Capacitor Ct does not discharge to zero potential. Rather, it is discharged to a value determined by the series resistance between the emitter and ground and the magnitude of the discharge current. The actual value to which Ct discharges is termed the "valley voltage." When Ct discharges to this value, the emitter junction of the UJT becomes reverse biased again; then Ct begins to recharge, and the cycle repeats. The charge-discharge action of Ct produces a sawtooth waveform signal. When it doesn't work. The operation of a UJT relaxation oscillator involves more than just raising the potential across timing capacitor at to the firing level. A certain value of current, called the "peak-point emitter current," is required to fire the unijunction transistor. 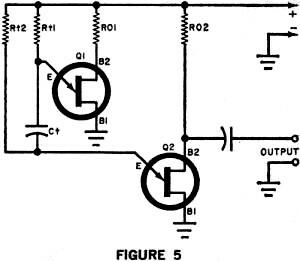 This current must be supplied through timing resistor Rt (see Fig. 2). If the current through Rt is too low, capacitor Ct will charge to a value that is below the peak-point voltage, and operation will cease. The UJT will not fire. This need for sufficient emitter current becomes important when Rt must have a large value to operate the UJT at a very low repetition rate. 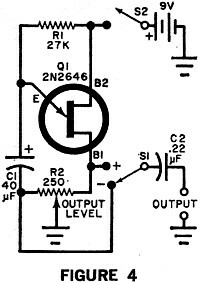 The peak-point emitter current for the 2N2646 is about 5 µA; for the 2N2647 it is only 2 µA. It is important to bear in mind that even though the 2N2647 is 2.5 times better than the 2N2646, if an electrolytic capacitor is used in the circuit, the leakage current of the capacitor has the same effect as an identical increase in the peak-point emitter current of the UJT. Consequently, care must be exercised in choosing a capacitor with the lowest leakage or the value of the 2N2647 might be lost. Characteristics vary from one UJT to another, even for those with the same type number. Thus, if the relaxation oscillator is to have a definite repetition rate, the value of timing resistor Rt should be made adjustable to allow you to "trim" the circuit to the desired frequency or repetition rate. The circuit shown in Fig. 3 has trimming facilities. Varying the resistance of either Ra or Rt2 varies the interbase voltage, thereby altering the peak-point voltage and, thus, the repetition rate. 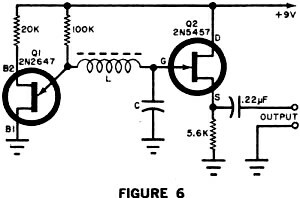 The value of potentiometer Ra in such a circuit should be limited to a maximum of 5000 ohms. Negative-pulse generator. Pulses obtained at the B1 terminal of a UJT are positive-going. Negative-going pulses can be obtained from the B2 terminal when a resistor is connected between B2 and ground. Negative pulses can also be obtained from a resistor connected in series with the lower end of the timing capacitor. The circuit shown in Fig. 4 provides a choice of either positive or negative pulses, depending on the setting of S1. 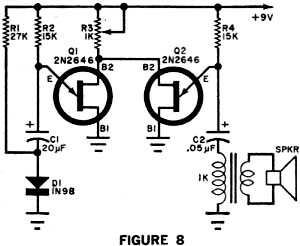 Adjusting the setting of level control potentiometer R2 adds resistance to one of the two circuits, while it subtracts an equal amount of resistance from the other circuit. So, when R2 is set for maximum amplitude of a negative output pulse, resistance in the positive side of the circuit is zero, and vice versa. This gives the circuit maximum efficiency, providing maximum pulse amplitude in either direction. The repetition rate of the circuit with the component values shown is about one pulse in every two seconds. This rate was selected to provide a useful instrument for checking experimental hookups of JK flip-flops, SCR's, SCS's, and other pulse-operated devices. Square-wave generator. The circuit of a square-wave generator (actually a dual-UJT multivibrator) is shown in Fig. 5. This circuit generates excellent square waves within the frequency range of efficient operation of the unijunction transistors. When the power is applied to the dual-UJT circuit, both emitters are made positive with respect to ground through resistors Rt1 and Rt2. One UJT fires promptly, bringing both ends of the timing capacitor, Ct, to a value well below the peak-point voltage. This UJT remains conducting while Ct charges through the timing resistor of the other UJT circuit. As soon as the second UJT's emitter becomes sufficiently positive with respect to ground, it suddenly conducts, driving the first UJT negative and causing it to stop conducting. With the second UJT conducting and the first cut off, Ct starts charging in the opposite direction, through the timing resistor of the first UJT. Now, when the emitter of the first UJT becomes sufficiently positive, it fires, and the second UJT cuts off. The alternate- stage fire/cutoff cycle is self repeating whenever power is applied to the circuit, and the output of the system is a train of rectangular pulses. Sine-wave generator. Sine waves are produced by allowing a UJT circuit to charge and discharge a capacitor through an inductance. When the charge-discharge period is equal to the resonant frequency of the LC circuit, sine waves are generated across the capacitor. A schematic diagram of a UJT sine-wave generator is shown in Fig. 6. 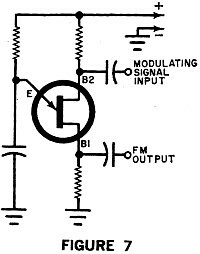 The tuned circuit of the generator is made up of inductor L and capacitor C. Field effect transistor Q2 operates as a source follower to prevent loading down the tuned circuit; this stage is not otherwise essential to the operation of the oscillator as a sine-wave generator. The circuit shown has operated well up to 50,000 Hz. The output of the sine-wave generator is obtained across Q1's source resistor. The waveform here is cleanest when the ratio of inductance to capacitance is high. Modulate a relaxation oscillator. A UJT relaxation oscillator can be frequency modulated by applying the modulating signal across a resistor in the B2 circuit as shown in Fig. 7. The waveform of the modulating signal can be sine, sawtooth, square, triangular, or irregular. A practical example of a modulated UJT oscillator is shown in Fig. 8. 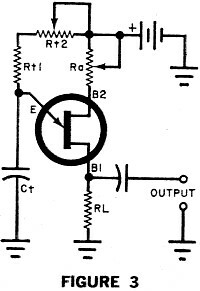 This circuit is known as a "bell-tone" oscillator. In operation, Q2 and its associated components make up a relaxation oscillator which, when unmodulated, has an operating frequency of about 700 Hz. Unijunction transistor Q1 and its associated components make up a low-frequency astable multivibrator. The wave-form of the Q1 setup is not as good as that of the circuit in Fig. 6, but it serves the purposes of the bell-tone oscillator well. In the multivibrator, C1 charges through R2, while diode D1 is maintained in a forward conducting state by the charging current and the current through R1. When Q1 fires, reverse bias is applied to D1, and the diode appears as an open circuit. Transistor Q1 remains conducting while capacitor C1 discharges through resistor R1. At the end of this interval, D1 begins conducting again, Q1 cuts off, and the cycle repeats. The result is a rectangular signal across R3. Since the B2's of Q1 and Q2 are tied together, each time Q1 fires, its B2 signal decreases the interbase voltage of Q2 and causes an increase in Q2's operating frequency. As Q2 conducts and cuts off, the pitch of the sound heard from the loudspeaker rises and falls sharply, giving the sound a distinct bell-like quality. The speaker is preferably a small one, such as a 3" replacement type, to provide "tinny" reproduction. When working with the circuit, adjust potentiometer R3 to obtain the most pleasing sound.